Buyers looking for luxury waterfront homes are now turning to New Jersey. 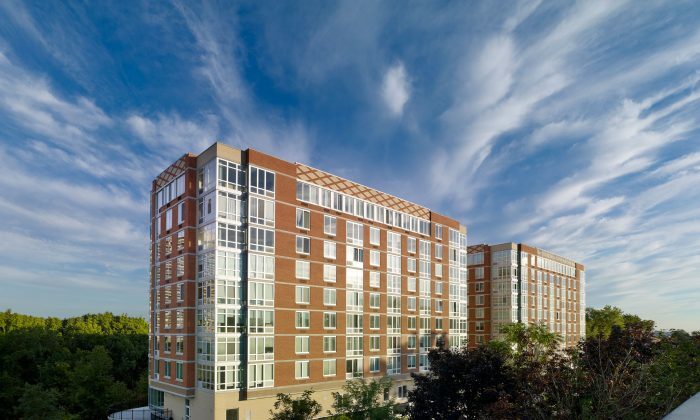 “[W]e’ve created a living environment that rivals some of Manhattan’s most exclusive buildings, but at a price that’s significantly less,” said marketing and sales agent Jacqueline Urgo of the newly renovated Trio at Palisades Park. The 140 units at The Trio range from 742-1,751 square feet, with floor-to-ceiling windows and modern finishes, priced starting from $310,000. There is a scarcity of new construction homes in Bergen County, and vacancy is at about 4 percent. According to the New Jersey Association of Realtors, the supply of homes in April went down 12.5 percent from last year in Bergen County. The majority of new developments are high-end condos, so that is what buyers are turning to. The Trio is a quick trip to Manhattan, just three miles from the George Washington Bridge. It’s a nine-story apartment building located at 800 12th Street in Palisades Park, a walkable, upscale residential neighborhood filled with retail stores and restaurants. Amenities in the building include parking, concierge service, media and game rooms, a yoga studio, and catering kitchen. Realtor Mindy Doong, who specializes in New Jersey waterfront properties, recently found the perfect fit for her client at the Trio. Her client wanted to downsize her home, and live in a maintenance-free apartment close to Manhattan.